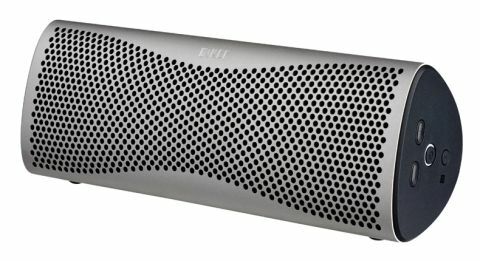 KEF Muo review | What Hi-Fi? In 2008, KEF launched the high-end Muon speakers. They were limited edition aluminium towers, sculpted by industrial designer Ross Lovegrove, and they cost £140,000 per pair. Yikes! Thankfully, their pint-sized descendant, our Award winner at this price point in 2015, is a lot more accessible. So it’s from high-end to bookend for the KEF Muo, a £300 portable wireless speaker. The Muo may be cheaper than its relative, but the premium pedigree is immediately apparent. Lovegrove hasn’t strayed far from the original Muon design so the outer shell is mostly aluminium, which KEF says is inert and ideal for eliminating unwanted vibrations. The wedge shape is not especially sleek, but a grille gives it the same sculpted hourglass aesthetic of the Muon. As far as portable wireless speakers go, this is one of the more attractive ones we’ve seen. It feels pretty tough, too, and its weight and structural integrity are consistent with something Colonel Mustard might use in the Library. It doesn’t have any waterproofing skills, however, which rules out taking the Muo to rainy festivals and summer picnics. On the inside are two 5cm drivers and a bass radiator. The drivers are an unusual design where the diaphragm is a combination of dome and cone sections decoupled with a flexible membrane. The idea is to emulate the behaviour and characteristics of KEF’s Uni-Q drivers in a simpler, more mechanical way. One of the main features here is Bluetooth 4.0 with aptX (superior Bluetooth if you have a compatible source), with a range of 10 metres. Pairing is a swift operation, especially if you do it through NFC (near field communication). You can pair with two KEF Muo units for a stereo configuration or a multi-room party mode. No Bluetooth? Then you can connect with a 3.5mm cable, though it’s not included in the box. Charging is via microUSB – a lovely braided cable included – and a full charge will give you around 12 hours of playback time. What about the audio performance, though; does it still stand up after a year’s worth of improvements by its peers and competitors? To an extent, yes. The KEF Muo is a versatile performer, capable of doing portable justice to Strauss’s Die Fledermaus and Prince’s Like a Mack alike. It brings an undeniable energy to the party. The Muo’s performance is defined by clarity, tight timing and wide dynamics. Insight and panache is immediately apparent – an impression that never wavers as we switch from cheesy rock to commercial pop via cinematic soundtrack (Kiss, Taylor Swift and Star Wars, in case you’re wondering). This little thing is hugely musical. Considering the box is a little over 20cm long, there’s a good sense of space. However, there’s no getting away from the size of the thing, and as such you shouldn’t expect it to rock the room. But what the KEF Muo lacks in scale and brute force it makes up for with articulacy. Small wireless speakers all too often sound cramped and confused, but this is not one of those occasions. Musical elements are well organised and given space to breathe. Even during the more chaotic pieces – anything by Atoms for Peace, for example – it is never a struggle to make out various textures and polyrhythms. The KEF Muo can be used horizontally or vertically, and an internal sensor claims to optimise the sound based on its orientation. We prefer the sound when the Muo is placed horizontally, as it feels more balanced and focused. It also benefits from the speaker’s rubber feet, which helpfully angle the speaker upwards a little. For the most part this is enough to keep it near the top of the tree when it comes to portable speakers around £300, but there’s no getting away from the fact the industry has moved on somewhat over the past 12 months. Pit it against the Dali Katch, for example, and you see that an extra £30 will get you greater scale, far more space, greater sense of dynamics and an overall more detailed and musical sound. There’s still space for the Muo in this market, and you wouldn’t be disappointed to have bought one last year and it still being your go-to wireless outfit, but there’s no denying it’s losing ground to its younger opponents. If we were perusing the market now, we’d opt for the Dali, but that isn’t to say the Muo isn’t worth a healthy audition.